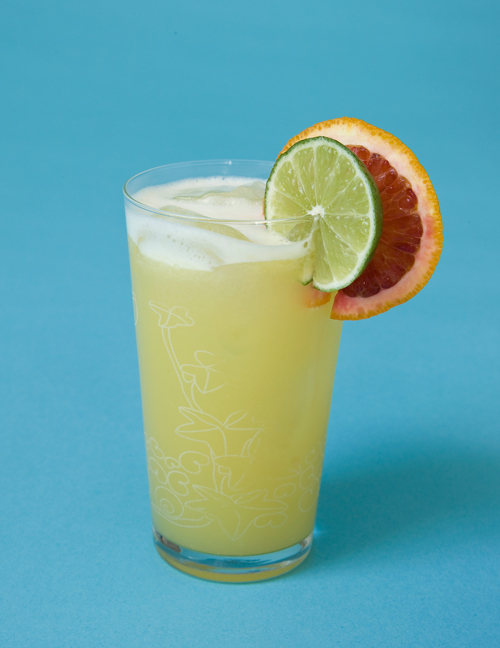 This fruity, juicy drink first appeared at the Raffles Hotel in Singapore in 1915, but that recipe has been modified often and radically since then. Our version has just the right amount of sweetness without distracting from the food. Shake the first six ingredients with ice and strain into an ice-filled glass. Top off with a splash of club soda and a maraschino cherry. Combine all the ingredients except the club soda in a large pitcher, add ice, and stir for about 30 seconds. Spoon out the ice cubes. Store the pitcher in the refrigerator until party time. As you pour each drink, top it off with club soda and a maraschino cherry.